"L" Shaped Graphite marver which fits a Major Burner.The extra graphite back piece offers more shaping and manipulation. 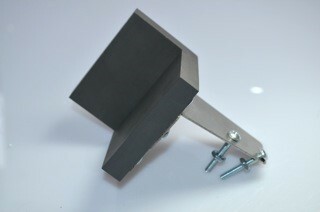 A graphite marver measuring 2" x 3" with "L" shaped plate , designed to fit onto the Nortel Major Burner. The marver has a bracket which fits to the side of the torch and is so useful for keeping millifiore, frits and enamel powders warm while working.